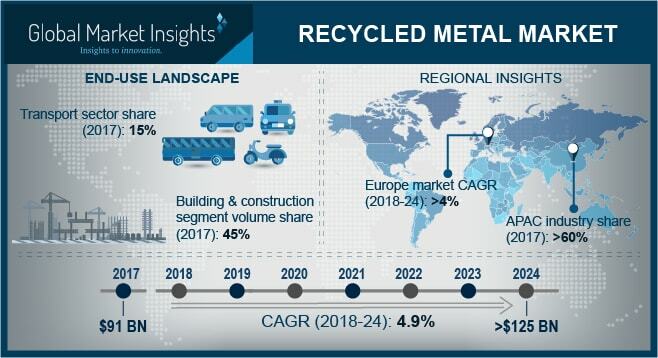 Recycled Metal Market size is forecast to exceed USD 125 billion by 2024; according to a new research report by Global Market Insights, Inc.
North America electrical & electronics industry is on the rise which is due to consistently changing consumer’s preferences and continuous technology upgradation. For instance, the electrical & electronics industry was valued more than USD 900 billion in 2016 and accounted for a total of 21% of the global electrical & electronics industry. These trends will drive reprocessed metal demand owing to its wide spread applications in metal plating electronics via electrodeposition. It provides improved corrosion resistance, enhanced electrical conductivity and improved solderability which helps in protecting against wear. Furthermore, precious metals such as gold, silver, platinum, rhodium, etc. are also widely applicable in the electronics industry owing to its unique physical and chemical properties which provides reliability to the electronics sector. It will help attain significant gains to the global recycled metal market share by 2024. Ineffective metal reprocessing is a key constraint which is probable to impede the global reprocessed metal market size by 2024. For instance, only 40% of the total copper produced is attained from recycling and 33% of the total aluminum produced is attained from recycling process. Nevertheless, rising emphasis on metal processing and reusability to reduce carbon footprint and impact of hazardous waste will generate plentiful opportunities for the reprocessed metal market size by 2024. Recycled non ferrous metal market size was valued more than USD 90 billion in 2017. Non ferrous metals such as aluminum, copper, lead, precious metals and other metals such as nickel, zinc, tin, palladium, etc. These metals find wide-ranging applications across construction, electrical & electronics, transport, consumer goods, industrial machinery, nuclear, military and several other end-user industry. For instance, lead is widely used electronics in batteries, ammunition, cable sheathing, etc. Lead batteries are used in transport industry and constituted approximately 35% of the total industry share in terms of volume in 2017. These trends will help boost the global recycled metal market share by 2024. In terms of volume, recycled metal market share for building & construction constituted close to 45% of the total business share in 2017. It is mainly due to comprehensive recycled metal applications in the building & construction industry. For example, ferrous metals (iron and steel) are broadly used in the construction of large steel frameworks in the building, bridges, drainage components and various other architectural frameworks. Furthermore, non ferrous metals including aluminum, copper and lead are also utilized in the building & construction sector. Lead sheets are used for roofing, cladding of vertical walls, soundproofing in partitions and ceilings in office, school and hotel buildings. These trends will help make considerable contribution to reprocessed metal market size by 2024. Europe recycled metal market share is projected witness gains of more than 4% during the forecast timeframe. This is primarily due to stringent laws and legislations imposed by environmental regulatory bodies in Europe, which has triggered metal recycling to reduce the carbon footprint and help save the environment from hazardous waste generated. For instance, Directive 2008/98/EC imposed by European Commission defines basic concepts related to waste management. It signifies terms and conditions related to waste, recycling and recovery. Moreover, Directive 2012/19/EU prevent the generation of electrical & electronic waste and to promote reuse, recycling and other forms of recovery to reduce the quantity of waste to be eliminated, whilst also improving the environmental performance. These trends are likely to make significant impact on the reprocessed metal market size by 2024. Key reprocessed metal market players are Sims Metal Management, Steel Dynamics, European Metal Recycling, Nucor Corporation, ELG HanielGmbh, Schnitzer Steel and Novelis. The market players are expanding their capacity to process metal to attain profitability in the market. For example, Novelis announced to build flat-rolled aluminum plant in January 2018 in Kentucky U.S. for USD 300 million.